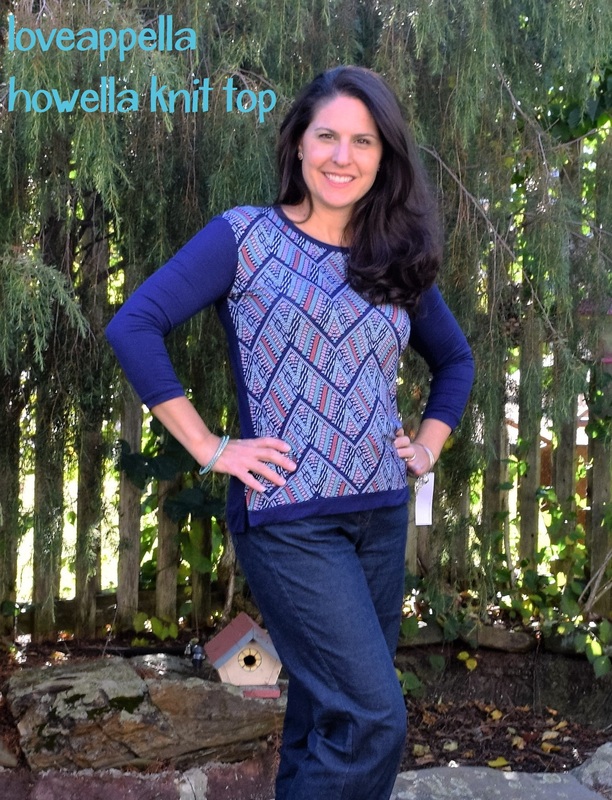 My November’s Stitch Fix Review was less than fabulous. With disappointment, I returned all the items and debated taking a month off from the service. BUT… I was brought up in a family of women who have taught me that if you are not satisfied with a service or a product that you have paid for, then the correct (and only) thing to do is to speak up. Amazing things happen when you speak up. December was obviously a busy month and I almost forgot about my January fix until I received an email asking if there was anything that I wanted to tell my stylist. I requested to keep the Senior Stylist and jotted down a note. “In the winter, I love sweaters and things that I can wear with leggings.” I think that is all I wrote and here is what was sent. Stitch Fix has finally heard my plea to make sure that the skirts and dresses they send me fall at the knee or below. The hemline of this skirt is a perfect length. The skirt is a beautiful burgundy color and the material is thick enough to wear in the winter with tights. It has an attached slip so you do not have to be hassled with adding one. Another thing that I was taught from the women before me- slips are a necessary to wear with skirts and dresses and disregard their annoyance while wearing them. These are a basic, dark navy skinny jean. They are lighweight and stretchy. In the past, zipper accents and I have had a love/hate relationship but on these jeans I think they are adorable. I love this shirt for so many reasons. I love the color. I love the design. And I love the tiny pearl accents on the side of the arm. Surprisingly, the blouse does not seem to wrinkle. It has been put in and taken out of the Stitch Fix box several times but it unfolds wrinkle free. As a mom, I think this is kind of a big deal! As soon as this sweater was pulled out of the box, I knew it was for me. The pictures do not do the color of the sweater justice. It is a pretty tan or more like a light coffee. I am not usually a leather accent girl. BUT I love the faux leather accents on this sweater. The sweater is big and warm and cozy! Yes, please and thank you, very much! This is how the sweater came out of the box. I was a little confused and worried about the neck. When I put it on a hanger, it was almost long enough to be a dress (with the hemline at or below the knee-haha.) But when I put it on, this is what it looked like. The long neck turned into a scarf-like accessory. It is cute but roomy and airy. To keep warm while wearing it, I will need something more substantial to wear underneath. Oh, and it seems to wrinkle easily but I think I can deal with it. It’s something new and I definitely do not have anything like this in my closet. It was a great fix and I decided to keep all five items! BUT I am trying to rid my house of clutter and things. So, I promised myself that if I wanted to keep any of the items, I needed to get rid of at least TEN items that I no longer need in my closet. I feel good about making space and updating my clothes at the same time. Wait, I thought this was a blog about FAITH, FAMILY, and HOMESCHOOLING? Why are you talking about clothes? I think “FAMILY” covers a wide area of topics. I love having two daughters and everything that comes with “sugar and spice and everything nice.” My girls love dresses, anything sparkly, and accessories galore. I feel that part of my responsibility in raising my girls is to teach them to care for themselves, show them how to dress in a modest and self-respecting way, all while promoting a healthy self-image. I want to show them that clothes and accessories can be fun and a way to express their personalities. When the Stitch Fix box comes, my girls love seeing what is in the box and how I pair the clothes with accessories. It’s like “dress-up” time for mom. It has become a great way to talk about hemlines, necklines, and tightness of fabric. I also make it a point to discuss how the things on the outside do not matter as much as what is in the inside does. That is what is most important. I want my girls to learn to celebrate being a girl while remembering self worth does not come from clothes or others’ opinions. It only comes from who she is in Jesus Christ. 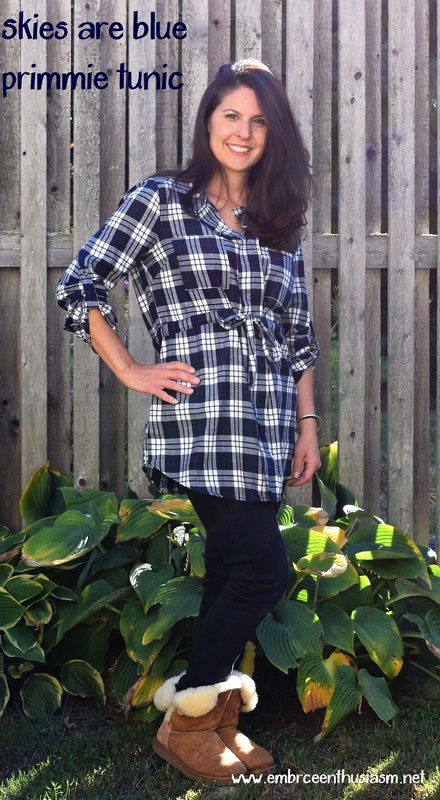 Check out my reasons for trying out Stitch Fix here. Read more about here www.stitchfix.com Read my last review here- November Stitch Fix Review. It was a great Fix!!! 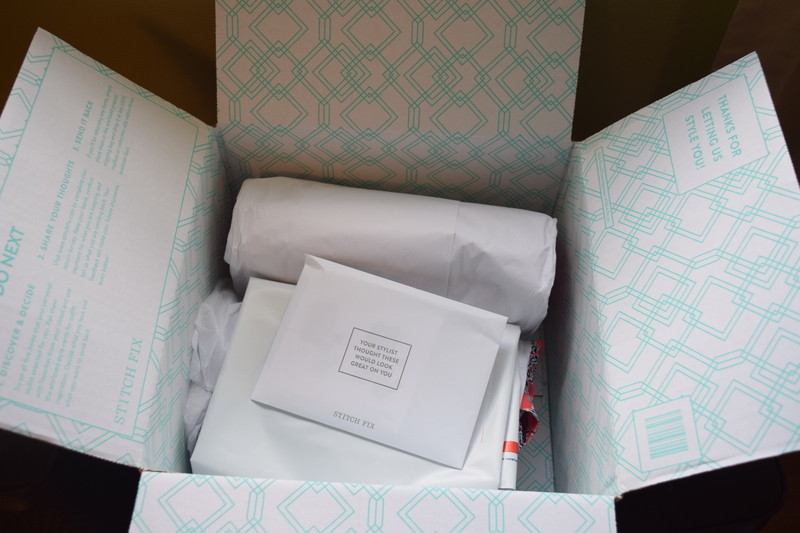 Would you like to try Stitch Fix for yourself? If you do decide to try it out, I would appreciate the referral. Please use Shanna’s Stitch Fix Referral link when signing up. As I always do, I added new pins to my Pinterest Board and made sure to make some notes to my stylist. The note included a lot of questions marks, which may have been a mistake. It went something like this- “Please send- a warm, fall/winter scarf? A jean skirt? Conservative hemlines and no distressed looks. A warm sweater? 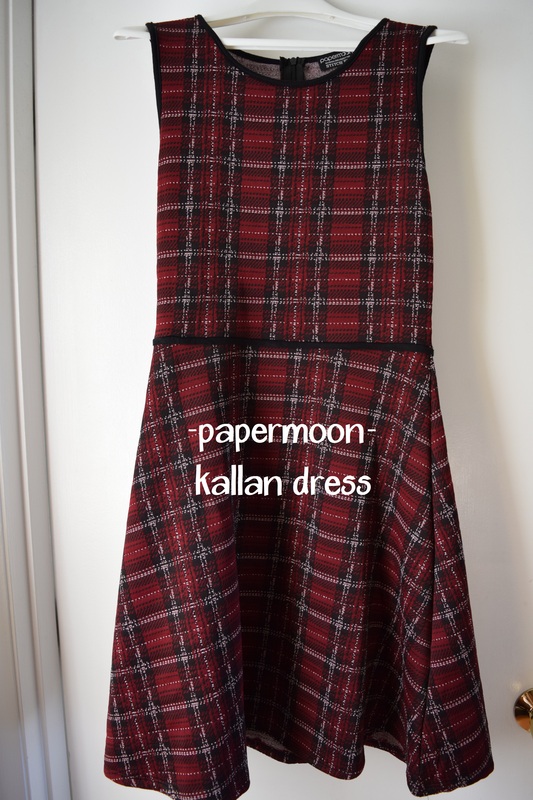 Fall/winter skirts? .” I wish I had saved the exact note so I could compare what was sent to what I wrote. I have had the same stylist for a long time so I figured that she has come to understand my style and that I could loosen up on my specific instructions. I guess I was wrong. From all the pinning, I had a picture in my mind of what items might be sent to me. So, when the box arrived, I ripped into it hoping to find that soft, warm scarf or comfy, over-sized sweater. It didn’t take long to realize that I had got my hopes up for nothing. I knew that most of the items would be going back. Disappointed, I threw the items back into the box and left them there for days before trying them on. I specifically asked for a warm fall/winter scarf. I specifically pinned warm/winter scarves. Beautiful, bright, colorful scarves. So imagine my surprise when I pulled this lightweight, gauze-like piece of material from the box. Ugh! Save your $32.00 and go buy a warm, winter Faribault scarf at Target. I REALLY wanted to like this skirt. I liked how it felt on. It was smooth and stretchy. I had asked for a jean skirt but I had also asked specifically that no “distressed” looks be sent. I know that distressed look is “in.” I was “out” when I saw the price tag- $108 for a skirt with holes in it. No, thank you! I am all for sparkles, sequins, and rhinestones. I really love the color gray. I have tops that open in the back. But this item, just plain confused me. The embellished neckline was very heavy (in weight and look), too much for the lightweight sweater. Not sure why the back opens the way it does because it the bottom of the sweater is slightly fitted. In trying to think positively, I thought that maybe this sweater is casual wear for a princess. So, I grabbed my wedding tiara for a matching accessory. Sadly, the sweater cost more ($88.00) than the tiara itself. Reminding me that I am neither from royal descent or from money and that this sweater is more for fairy tales than for real life. This skirt was the one bright spot in the box. I love swing skirts! 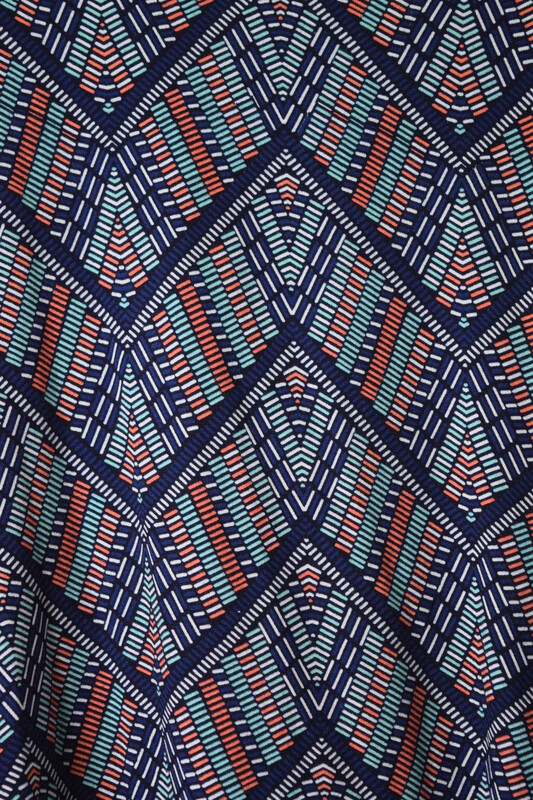 It has a great trendy pattern. The skirt fit well and has a conservative hem line (thank you, stylist!) The only problem I had with this skirt was the type of material. It was very thin and a bit see-through. I would have had to wear a heavy slip to wear it out of the house. (The mummy-scarf would go perfect with it for a spring look.) Yes, I could have kept it and saved it until spring. But would I remember that I own it in the spring? 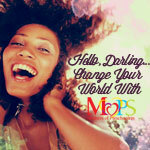 I have been trying to simplify my closet and rid the house of things we do not need. So unfortunately, this skirt is not something I need right now. The color of this sweater is PERFECTION! I love the richness of burgundy. Cable knit sweaters are awesome-always have loved them. BUT WHAT ARE THE ZIPPERS DOING THERE??? They look so out of place. Like finishing touches that break the sweater rather than make it. The sweater would have been perfect without those zippers. Ugh-again! I must be getting old! Disappointment. I hate being so down-beat and gloomy. I know that the “Fixes” can not be a winner each time. I know that I will not always like all the items sent. But the items sent seemed too far off from my notes and Pinterest’s pins. 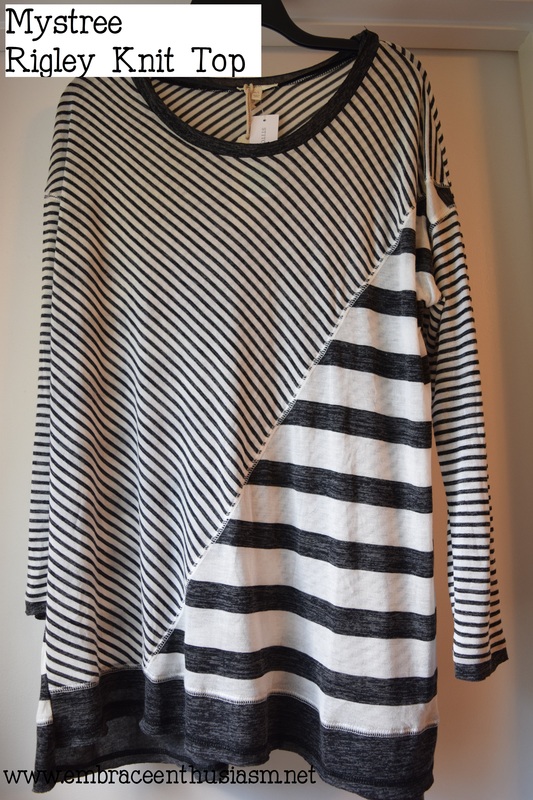 BUT I am not giving up on Stitch Fix…. yet. I was just given a gift certificate and I am now debating on moving up my Fix from January to December. Then again, maybe I should just take a month off and clean out, get my pins and notes together. It might be a nice way to start the new year! Read more about here www.stitchfix.com Read my last review here- October Stitch Fix Review. It was a great Fix!!! Fall is finally here! There is a crisp, fresh chill in the air. The leaves have started changing colors and gliding off the trees creating unique, mosaic-like patterns on the ground as they lay. My Uggs and a few other cozy fall items have been pulled from storage with joyful anticipation of fall adventures to come. Fall in New England is the best! I was so excited to receive my October’s Stitch Fix. I had made some specific notes to my stylist. I wanted a warm, cozy sweater to wear with leggings and boots. A tunic with leggings would be nice. I asked for a black blazer to wear over dresses for church and speaking to groups. I told my stylist that I love receiving dresses but I STRESSED the importance of a sending me dresses with conservative hem-lines (in the past this has been an issue.) Finally, I took time to add a few new pins to my Pinterest Board. I tried to cover all my bases. When the box arrived, I only had a minute or two to see what was sent. At first glance, I loved everything. I couldn’t wait until the afternoon when I had more time to try everything on. I hoped that the items would fit as good as they looked. 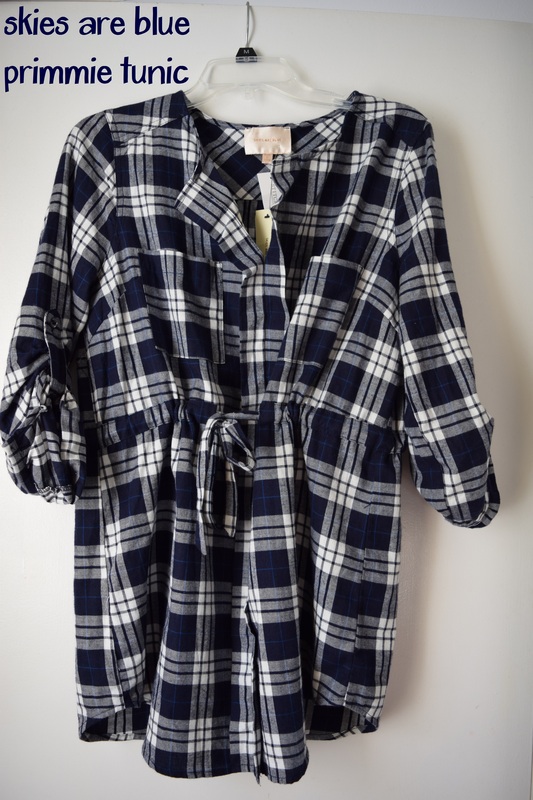 This navy blue, flannel tunic is soft and warm. I paired the tunic with Kensie skinny jeans and my Uggs. The Kensie jeans came in one my first fixes and are still my favorite jeans. They have held up nicely which proves that paying a little extra for better quality clothing goes a long way. 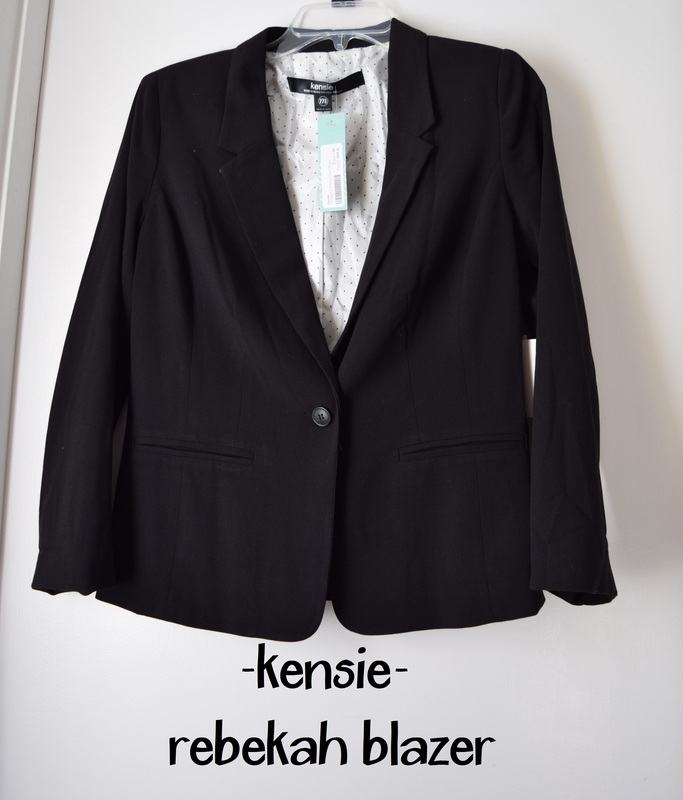 I asked for a black blazer and I got a black blazer. Basic, versatile, comfortable, and well-made. This is the same designer as my favorite skinny jeans. What can I say? It is just what I wanted and my stylist did a great job listening to my notes. The burgundy color of this dress affirms that fall has arrived. I like the fit and style of the dress. It actually reminds me of a dress I had in high school and I love that. It felt familiar when I tried it on. I first paired the dress with a pair of Sam & Libby’s Bow Flats (from Target) to complete my 1994 look. 🙂 Then, I decided to add ankle boots and the Kensie blazer for a second look. The only thing that I do not like about this dress is the material. It is on the thin side. I am not sure how it will hold up after wear and care. In my opinion, it is also a bit pricy for the quality of the dress. 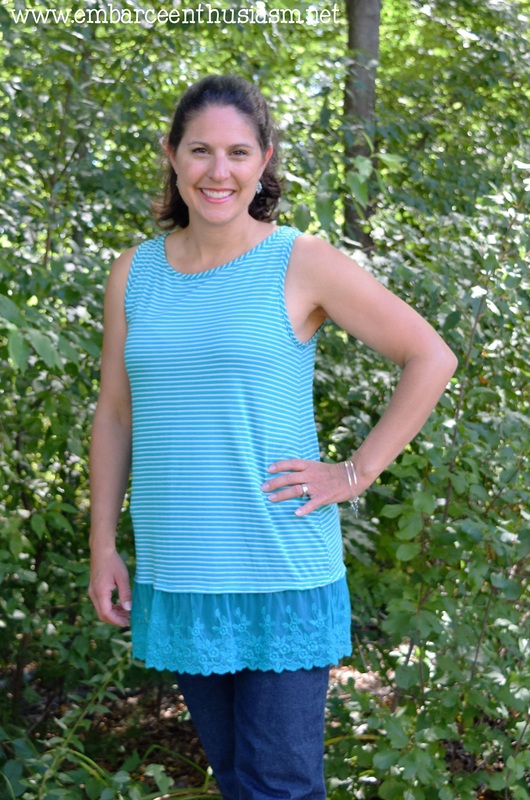 This is what I love about Stitch Fix! I would have never picked out this item for myself. In the store, I would have said too busy, too much pattern. But at first glance, I loved the colors in the shirt (corals and aqua) and the material felt nice to touch. I was curious to see how it would look on and I was pleasantly surprised. The material is soft and stretchy. Not only does it fits great and it feels good on! I really did not need to try this on because I had already decided that I was keeping it when I first laid eyes on it. 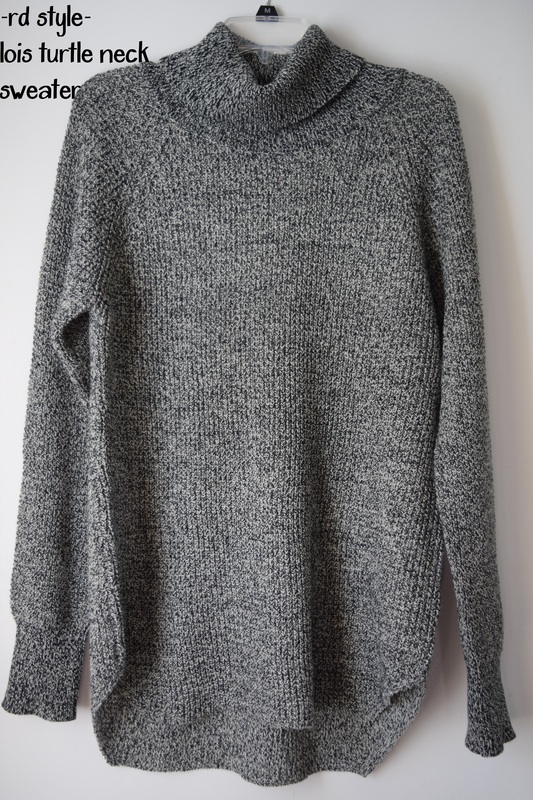 It is a perfectly, cozy, warm, well-made sweater. There is nothing more I can say but open my arms and welcome fall in! 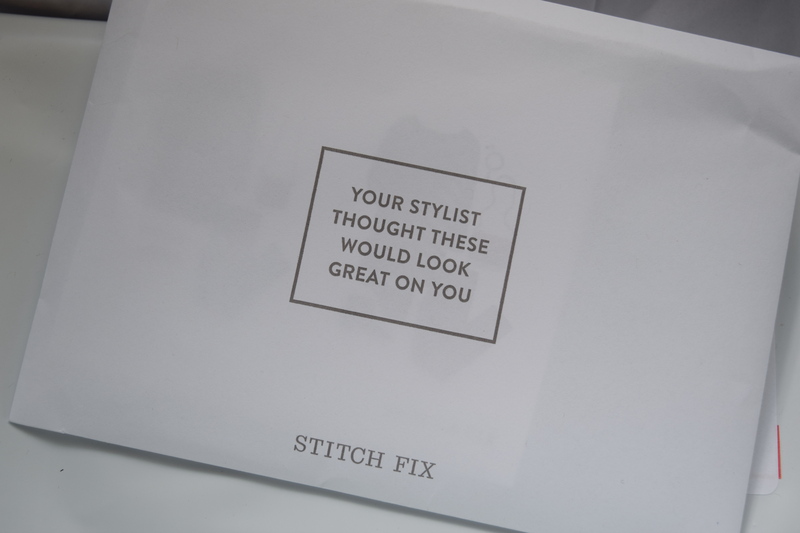 Would you like to try Stitch Fix? If you do decide to try it out, I would appreciate the referral. Please use Shanna’s Stitch Fix Referral link when signing up. About a year ago, I came across an online ad about a new personal styling service called Stitch Fix. I was intrigued. My son had just turned one and I was reemerging out of the baby stage into somewhat of a normal schedule. I was sick of nursing tops, t-shirts, and black yoga pants and was ready for a pick-me-up in the style department. My current outfits lacked color and pattern but I did not know how to add new items to my existing closet or what new pieces would look best on me. And finding a new style required time and patience that I did not have. Dragging three kids from store to store, looking for the perfect new look, is not what I call enjoyable or practical. I needed convenience and help. All these things drew me to Stitch Fix. The service seemed to be the perfect solution for my fashion woes. For a small styling fee, Stitch Fix provides you with a stylist who handpicks 5 items for your based on an online Personal Style Quiz that you fill out. The five clothing items and/or accessories are unique to your taste, budget and lifestyle. They come carefully wrapped in tissue paper and are sent to your doorstep in a cute little box. When your Stitch Fix box arrives, it is as fun as a Christmas gift just for you. I just received my 10th Fix. In my opinion, my Fixes are getting better and better each time. I have requested to keep the same stylist because I feel she just “gets me.” There have been times when I have received clothes that I thought were too expensive or that were completely not my style but no problem, I just send them back. I also make sure that I make specific notes to my stylist and keep my Pinterest board updated with styles I am interested in and like. I also should say that Stitch Fix has amazing customer service. One time, I completely hated my Fix and they refunded me my styling fee. Another time, I received a beautiful dress that had a broken zipper, they gave me a credit to have it repaired. They are easy to work with and they follow up with customers. I love their Pinterest boards and their Facebook fan page. Overall, I have been extremely happy. It is convenient and fun. There have been many items that I would never have picked out myself but have ended up loving. I started off by receiving a Fix every month but that was a little too expensive for my budget. Now my fixes come every other month. I love that you can choose the frequency of your Fixes. 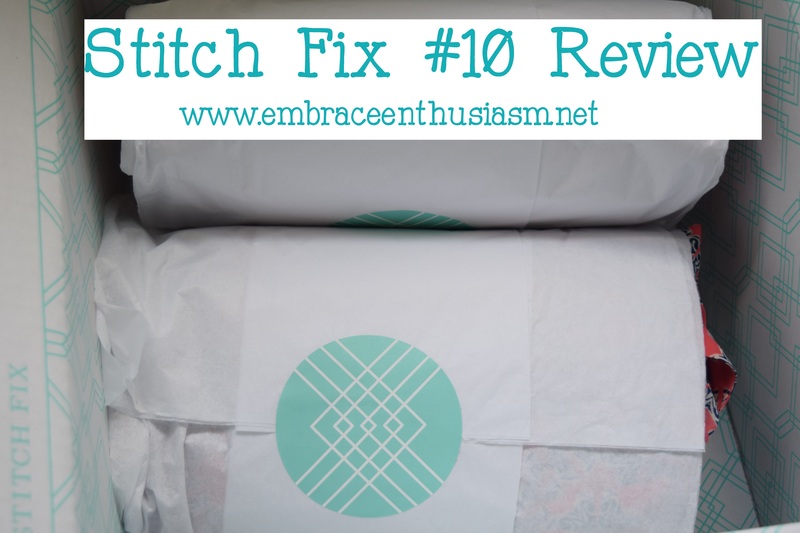 I have had many people ask me about Stitch Fix and I love reading other people’s reviews of their boxes, so I thought this month I would grab my camera and my photographers (a.k.a. my kids) and review/model my latest items in my Fix. I noted to my stylist that I would be traveling in September. She sent me this beautiful, reversible tote bag. 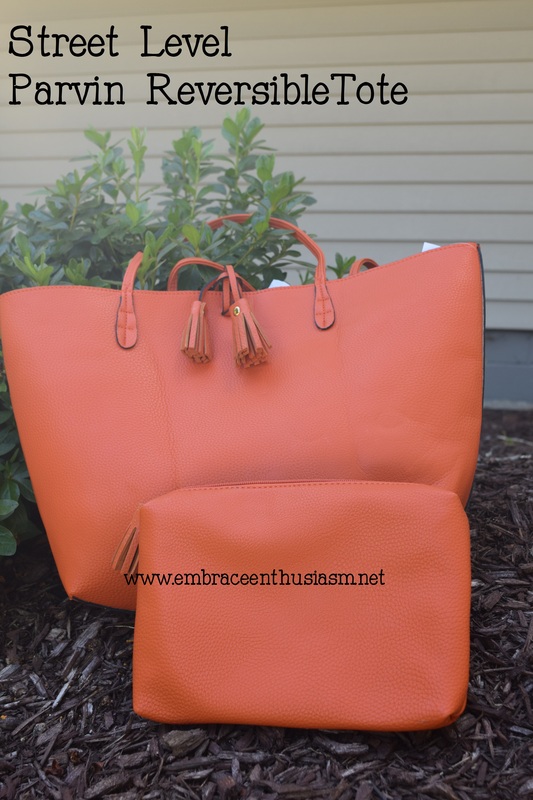 I love the burnt orange color- great for fall. The material is soft and durable. The large bag is a good size with plenty of room. The best part is the larger bag folds up to fit in the smaller bag making it even more convenient for traveling. Two bags in one! 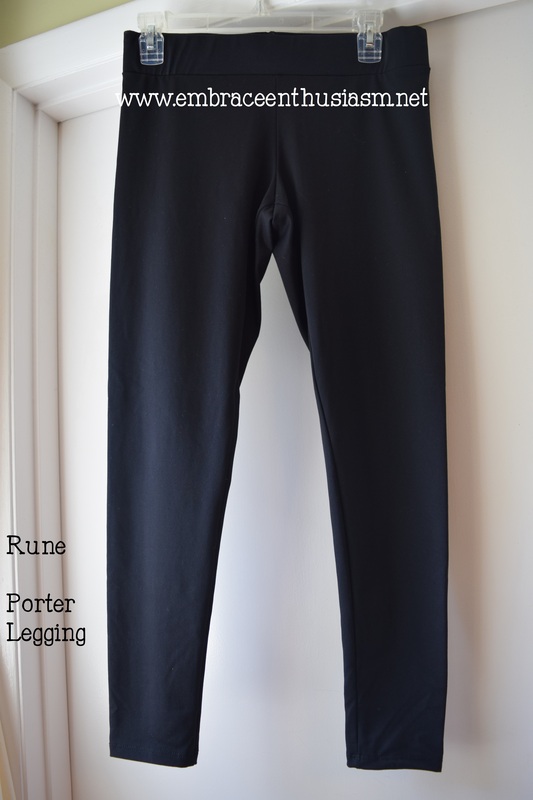 Basic black leggings. Nice, thick, comfortable material. I think these will be great for fall and winter. They were a little more than what I would normally spend on leggings but when I took into account the whole fix and what I would save if I kept everything, the price seemed okay. 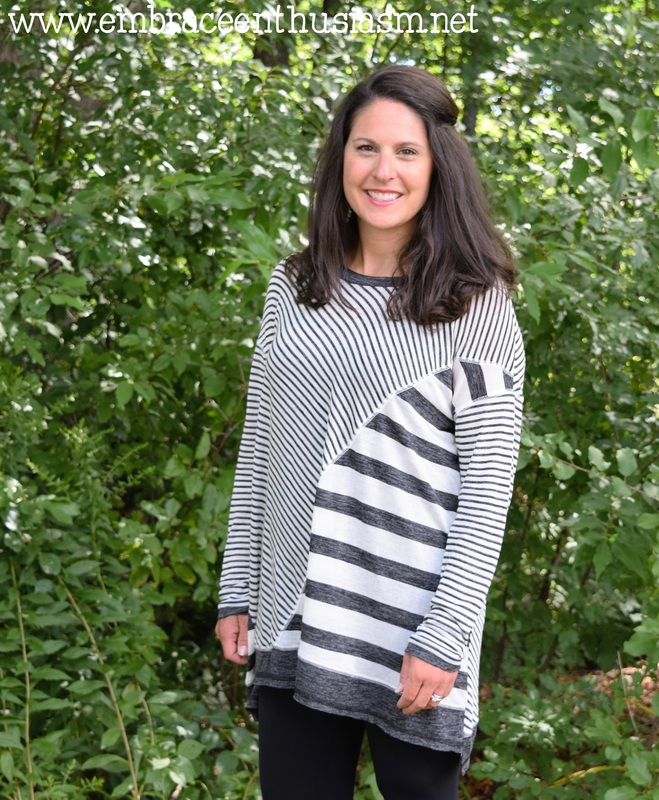 My stylist sent me this soft, comfy, flowing tunic to wear with the leggings. I paired the tunic and leggings with tall riding boots. The tunic is a bit more sheer than I like so I tried it on with a black tank-top underneath. It is warm and comfy. 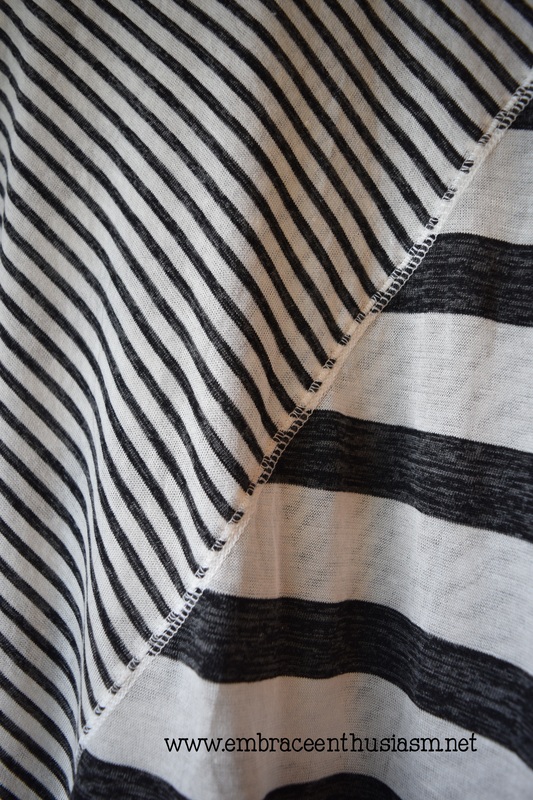 I love the different types of stripes on this shirt. Not sure if it does anything for my figure but it is right up my alley when it comes to fall, travel fashion. I think this is my favorite item in my Fix! This shirt is the most beautiful color of coral that I have ever seen. 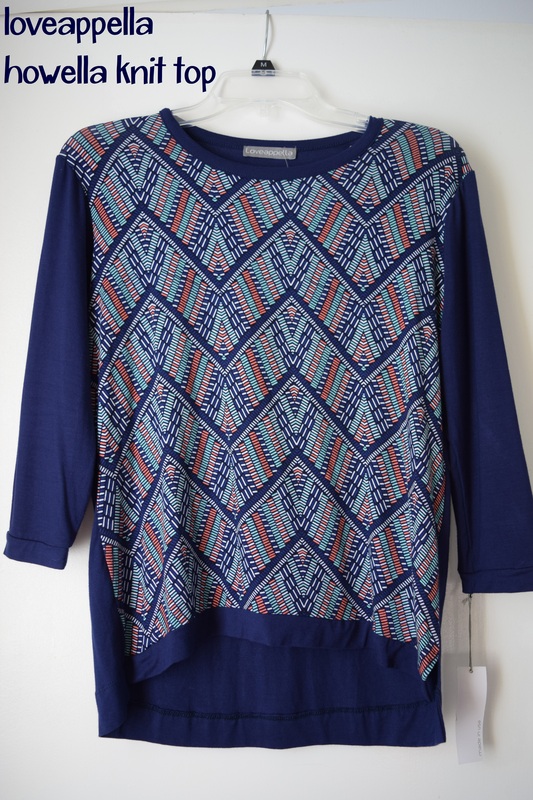 It has a very pretty navy blue pattern. The whole blouse reminds me of a visit to a tropical island. The shirt buttons up in the front. The sleeves can be buttons as well. It is a sheer blouse so I wore a navy blue camisole under it. It complimented my completion perfectly. It is one of those pieces that makes you feel good and confident wearing it. It was the easiest item to decide to keep. My last item, was a shirt that made me feel like a ballerina. The lace on the bottom reminded me of a tutu. A long shirt that fit loosely and covered nicely. 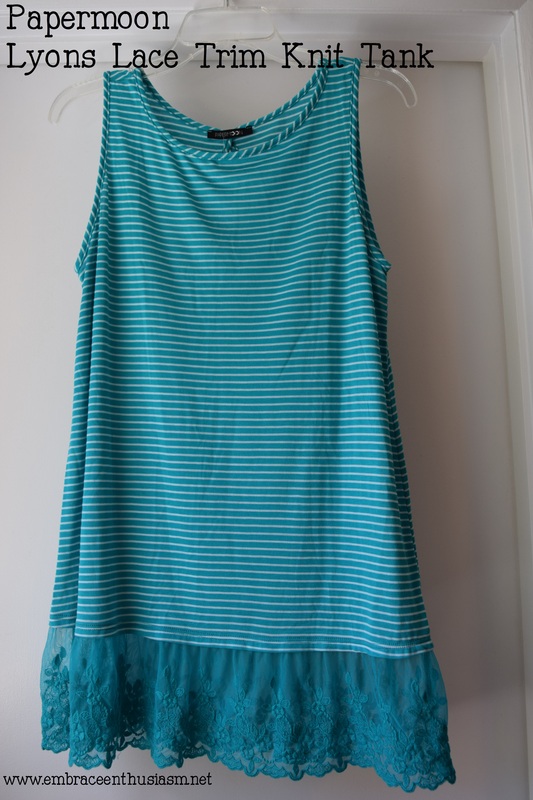 It is a beautiful shade of teal with cute white pinstripes. I liked the shirt better with jeans than with shorts. Maybe it would look good with leggings, I did not try that. Overall, a nice shirt. After much deliberation and trying each item on about three times, I decided to keep the whole fix. I had originally thought to keep just the bag, the black and white tunic, and the coral blouse but when I added the three together it came to more than keeping the whole fix (with the 20% off discount.) It made sense for me to keep everything! I am happy with this fix and having some new colorful clothes in my closet. My next Fix will be arriving in October. I will review it here when it comes. 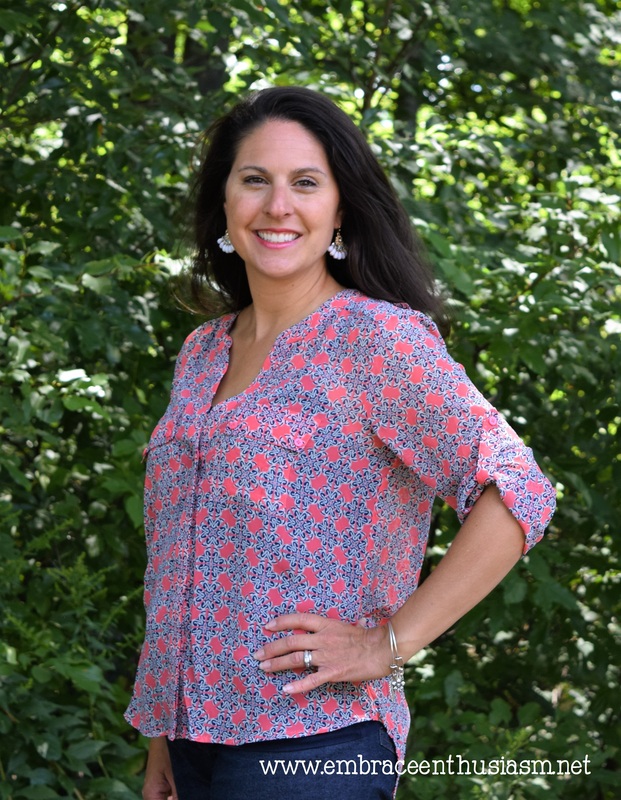 Would you like to try Stitch Fix? If you decide to try it out, I would appreciate the referral. Please use Shanna’s Stitch Fix Referral link when signing up.